d. Shortcut in circumstances where water is not available? a.As a preliminary to all nitya and naimittika karmas (daily and occasional rituals) like b.Sandhyavandanam, Brahmayagyam, Vedadhyayanam, Pitrutarpanam Mantra japam etc. 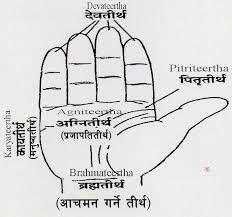 n. If during chanting of mantra, we happen to see anything dirty, Achamana should be performed and chanting recommenced. 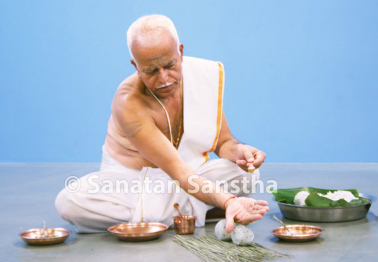 o.During meals, Homa, taking of alms , eating , or giving of alms, we need to perform Achamana twice. 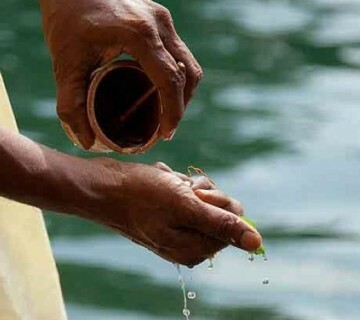 c.Aachamanam should not be done with impure or falling water, as from a tap or rain, but usually with water from a river or tank, or from a vessel held in the left hand. When doing this in a river or tank, the left hand should be touching the water. d.It should not be performed casually, while speaking to others, wearing a shirt or footwear, with a covered head, with laughter etc., but with devotion, and with the consciousness that one is uttering the holy names of the Almighty, which purify and protect. a.A Brahmin becomes purified by Aachamana when the water swallowed reaches the heart, A kshatriya when it reaches the throat , a Vaishya when it reaches the palate and a Shudhra or a lady when it touches their lips. Exhaustive work. Plenty of information. Thanks thousand times. Really informative ! Thanks & my humble pranams ! Looking for seeking this kind of information from so many days. Thanks for providing very insightful information. Satadha vandanamulu. I chant Ramanaka Varshe for USA -> What should I chant for Costa Rica? I chant Aiyndra Ghande for USA -> What should I chant for Costa Rica? I chant ramyaka Pachime dise for USA -> What should I chant for Costa Rica? Please send me an email to maharajk@gmail.com. Will be grateful if I get an email response. I have been reading various posts and valuable translations of our scripture I am 74 - a Yoga teacher - now doing MSc in Yoga Therapy from SVYASA, here we need to study veda, upanishads and other scripture as part of our curriculum. I find your work quite helpful. Thanks. Really very informative, only one correction "Brahmin becomes purified by Aachamana when the water swallowed reaches the heart", it's not heart the right thing is "Nabhi" as according to Devi bhagavatam 12th Skanda. Very detailed article.Should aachamanam be done twice or when all it should be done twice.Please clarify.